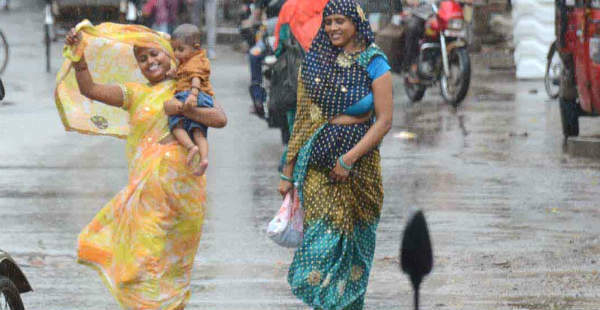 Uttar Pradesh, which has been struggling with dry and hot weather, can get good rains during the next two-three days. There is a possibility of dust storm and rain in many places in the eastern and central parts. Due to this change in weather, there will be much anticipated relief from high heat and humidity, however, there is a possibility of loss of life and property in some places. According to experts at Skymet weather, currently a cyclonic circulation is seen on the south-central parts of Uttar Pradesh. Apart from this, a cyclonic circulation is also over Bihar. A trough is also extending in proximity of the region. Along with this, humid winds from Bay of Bengal are reaching Uttar Pradesh, which are likely to cause a change in the weather over the state. During the next two-three days, in the eastern parts of Uttar Pradesh, activities like dust storm and cloudburst will be seen. Along with this, there is also a possibility for rain and lightning. However, with change in the weather, even though people will get some relief from the hot weather, there is also a possibility of some damage. East Uttar Pradesh will be the most affected region. Thus, there is a need to take special vigilance to avoid the weather conditions during the next 2-3 days in Varanasi, Allahabad, Mirzapur, Banda, Chitrakoot, Jhansi, Kanpur, Lucknow and surrounding areas. Apart from East Uttar Pradesh, some places of the central districts and West Uttar Pradesh will also see adverse weather conditions.